These grants are for Ithaca City School District public schools. Find the Mini-Grant application links below, fill in the google document below and submit your grant application electronically by emailing it to FABGgrants@ipei.org. Need help? Read below the attached list of funded projects and contact us with your ideas. As a part of the application form, you will see a FAQ page and criteria. The FAQ page and criteria will give you a sense of some of the often asked questions and the focus of FABG’s priorities. It takes about one month to review the applications. Fall projects may start after November and Spring projects after late February or early March. Art, music, drama and dance teachers may apply for an Opportunity Fund grant for things that fall outside of the mini-grant deadlines. See the Opportunity Fund application google document link below. We prefer you to use the mini-grant deadlines, so this Opportunity Fund is when something suddenly comes up. As you fill out the forms, you will need to click the back button to return to this page. You may wish to open in another tab. IPEI also has grants available through the Red and Gold Grant, the Teacher Grant and the Community Collaboration Grant. Go to www.ipei.org or click on the IPEI logo on the left of this page. Arts Grants are also available through the Community Arts Partnership. Their grant deadline is mid November. Go to www.artspartner.org and check under grants. 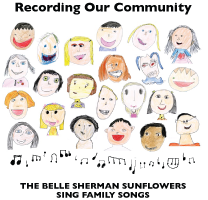 FABG's Mini-grants provide support to teachers for projects and initiatives ranging from artist’s visits to funding an accompanist for the CD above, produced at Belle Sherman Elementary School, 2008. Booster grants tend to be of modest size, around $500 or less. Contact us to discuss your idea or if you have questions. We encourage you to apply.